2019 AFC 아시안컵 조별리그 16강전 바레인전! Same 4-2-3-1 with Hong Chul and Lee Yong returning to their fullback positions. Korea starts brightly, but with Bahrain’s ultra compact defense, Korea found it difficult to thread the needle in the final third – limited in even their usual high shot production numbers. Bahrain however managed to get on their offensive front foot faster, registering several shots before Korea got their first on target. Lee Chung-yong, who had been very proficient in the group stage, looked flat and gave away a dangerous backpass that nearly led to a successful Bahrain counter. The Blue Dragon, as the Tavern broke the news last weekend, flew out unexpectedly to Korea to attend his sister’s wedding. Analysts will wonder, might other rotational options been better than a jetlagged Chungy? The half was ending fast – Korea’s ineptitude in the final third looked like it would play out to a frustrating 0:0 scoreline for the break, but Son, using a bit of skillful footwork, left his mark in the dust and drove forward down the middle with acres of space. He quickly found Lee Yong as Bahrain scrambled to reformat the backline. Lee Yong one touch pass to Hwang Ui-jo right in front of goal – Ui-jo’s backheel diverted shot was unable to get past Shubbar, but the rebound came right to Hwang Hee-chan. The Hamburg man calmly sent it into the opposite corner of the net – Goal! 손흥민의 깔끔한 침투패스와 이용의 날카로운 크로스! Korea’s 2nd half starts brightly but fatigue starts to set in. Passes weren’t as crisp. Hong Chul and Lee Yong once again delivered miserably placed crosses and the offense looked as predictable as it was ponderous. Bahrain were ready to take advantage of the slim Korea lead, having already tested Kim Seung-gyu having to bail out Korea with a super save. Lee Chung-yong, looking fatigued and not on his best game, subs out for Ju Se-jong in the 68th minute. Then in the 77th minute, disaster struck. Kim Min-jae, who has been relatively solid at CB, was caught out of position – kind of a odd play as a Bahrain long distance shot then takes a fortunate deflection to Mahdi Al Humaidan, his short range shot gets blocked by Hong Chul but rebound fell kindly to Romaihi, who did not miss from close range. Korea concedes for the first time. Korea went into extra time looking woefully close to the edge, looking nervy, particularly with some rust showing on Lee Seung-woo who was eager to get into the tournament. However, Lee’s heavy touches betrayed his energetic dribbling. Bento played one more card from his hand, using the 4th extra time sub to haul off Hong Chul -who continued his erratic off target crossing and installed Kim Jin-su to provide more clarity as the LB / left wing. Indeed the move would pay off in spades: after several fruitless crosses, this time in the 107th minute, Lee Yong delivered a beautiful cross that went over the heads of the backline and was going straight for Kim Jin-su – he leaned forward, took aim and rocketed a header past the scrambled defense and the helpless arms of Shubbar. Son and company kept up the attack, Son teeing it up for Lee Seung-woo and later for Ju Se-jong- the latter hit the post – and in the scramble, a penalty shout went unheeded as the ref didn’t get a good angle to see the clear handball on replay. A few heart attack moments came and went for Korea. They saw out the result to the end of the 2nd overtime. -We observed in the last group game against China the gamble Bento took with leaving Son in the game for nearly all 90 minutes. With Son having already played 90 against Manchester United only 3 day previous – the risk that Son would not be at his best for the long haul of the tournament was evident today. He was still a positive force undoubtedly, instrumental in the first goal and in the buildup to the extra time goal, but some heavy touches and wayward balls lost were indicative of the fatigue that captain Son’s is under. From what we know on countless Spurs matches and from the Asian Games tournament format, Son is not at his best form in those compressed circumstances when he’s not fresh. -The fullbacks of Lee Yong and Hong Chul is less than ideal, and that’s putting it kindly. Certainly Lee Yong was instrumental in both goals – and deserves plaudits accordingly. However, if the Tavern statistician was still employed – he would probably find a poor ratio of successful crosses in this particular match. While the verdict is mixed for Lee, its more decisively negative for Hong Chul and his wayward crossing from the left. It makes sense that the game turned around when Bento, finally at the end of his patience with Hong Chul in overtime, finally subbed in Kim Jin-su – who was providing more of an effective attack down the left. -Lee Chung-yong shouldn’t necessarily get stick for going to his sister’s wedding….I’m not going to weigh in on that so much as Bento had a chance to start someone against Bahrain who wasn’t jet lagged. 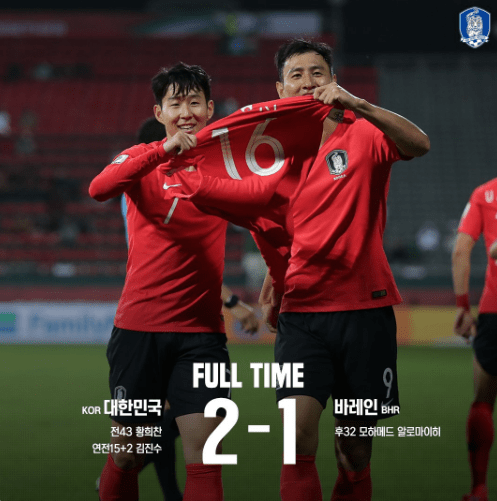 I’m going to suggest something controversial at this point: that Lee Seung-woo, who had a rough intro with his own heavy and rusty touches, nevertheless should have started instead and that Korea would have been more effective today had that happened. The Asian Games provides some anecdotal evidence to that claim – he’s not as effective as a sub (save for the final match vs Japan with his game winning shot in overtime) but more so when he can start and get into the groove of the match. To be able to start a tempo can be important to the chemical flow of his game. With a late introduction today, he looked nervy in getting into the match, with a desperately needed goal hanging over the proceeding – his heavy touches were that of someone who hasn’t played a single minute of the match. That may sound like an apologist for Lee but if you look back to the totality of his 30+ minutes on the pitch, he grew into the game and settled down, carried the ball and linked up more efficiently with his compatriots. Had he gotten a more composed shot in extra time, the narrative (or the internet) would have certainly exploded. The Korean media may (or may not be) drumming up some sort of Bento/Lee Seung-woo induced conflict, but aside from that unnecessary distraction, the potential is still there for Lee Seung-woo to contribute, be that creative attacking outlet that Korea needs and help out his weary side. Bento’s substitution is a late acknowledgement of that fact: Bento is running out of options by not having rotated properly during the group stage. 2 days rest between now and the quarterfinals adds to the pressure the Korea camp is now under. It’s a shocking admission and since then, the thoracic surgeon/non sports medicine doc flew back to Korea – with the odd excuse that his contract expired midway through the tournament. As Steve Han wondered outloud: why did the KFA elect to bring him to the UAE for the Asian Cup? The question now is: will the KFA now do the proper thing and get a legit sports doc now? -On the positive side: Jung Woo-young looked decent today – better precision with his passing (than usual). Hwang Im-beom looking very Ki like today, and more importantly, seems just a tad faster than his mentor. Composed under pressure – hardly put a bad foot forward (though his shooting could be a bit more clinical). We saw a better version of Hwang Hee-chan -who has gotten clobbered by netizens for his missed opportunities in group stage. For sure, that happened today as well, but his performance wasn’t just summed up by getting onto Ui-jo’s rebound; his passing and dribbling looked sharper. In short, he looked more confident – particularly after scoring his first goal of the tournament. And just in: Korea will face Qatar in the Quarter final – they get a 1:0 result against Iraq – and they did it in 90 minutes. Only caught the last few mins. of overtime, I’m tempted to vent, but I’ll just say this was frustrating. A win is a win, but w/ the exception of the China game, they’ve all been pretty unconvincing. Growing steadily disillusioned w/ the Hwangs, particularly UJ; is he an example of “Form is temporary, class is forever”? HC at least has the excuse of being 22. I’d appreciate if you guys could do a writeup on Bento-as-coach, sometimes I don’t know what to make of his calls, particularly concerning subbing, or lack thereof. I think back to the ’14 WC, Messi takes Arg all the way to the final. Ppl noted he didnt look the same for the NT, and he confided to a relative that towards the end it was as if each leg had a 10kg weight strapped to it, he just physically couldn’t do anymore what he normally does. I hope this doesn’t become Son’s fate, cuz I fear Bento may be driving him to this pt. ; is he really that oblivious or desperate? I’d really like to know. Indeed – what you pointed out – that’s the concern that a number of analysts are looking at as Korea goes further in the tournament. Bento brought in Kim Jin-Su in the 96th and he scored the winning goal in the 107th. I’d consider that a great substitution. It gets a bit difficult as a the lone striker up top against that kind of defense. That one vs one was unfortunate but I don’t think that’s enough to say hwang is down in form. Hopefully Qatar opens up a bit and we can see hwang be a little bit more dangerous. Yeah, don’t wanna be too down on the team; the little I saw of overtime, there was still some nice passing, quick 1 touch link play, couple incisive through passes even at such a late juncture when they must’ve bone tired. Just couldn’t seal the deal. Way I see it, even when on a downturn… they still won those games haha. Here’s to hoping they finally get their acts together, tighten up on their shots. Cuz if they don’t, upcoming teams won’t be so forgiving. Yeah I don’t think Hwang Uijo is out of form at all. He’s been striking the ball with confidence, but he doesn’t seem to be getting good enough support from his teammates. KNT seems to be trying to create chances by playing one twos through the middle, but they don’t have the right players in the lineup and good team cohesion to pull it off. I think KNT really misses Lee Jae Sung and even Nam Tae Hee. I thought Bento took too long to make his subs and made them play too cautiously late in the 2nd half. Hong Chul, who looked like he was just doing passing drills Bahrain’s GK instead of finding his teammates with crosses, obviously should have been taken out. Around the 60th minute, I would have taken Hong Chul out for Kim Jinsu and Hwang IB(really sloppy with his forward passing) for Koo/Ju Sejong. that Kim Jin Su goal was good. Is Qatar a relatively more difficult oppponent than Iraq would’ve been? Not too familiar with either of those teams. I was curious about that as well. According to FIFA rankings, Qatar is 5 places behind Iraq (https://www.fifa.com/fifa-world-ranking/ranking-table/men/#AFC). But from what I’ve been reading Qatar is an up and coming team with a new coach that is working hard to make a good showing for the next World Cup, and they have the 2018 AFC player of the year. Actually it looks like their fullback Abdelkarim(?) and AFC POTY got a yellow card against Iraq and won’t play against KNT. Lee seung woo is going to be a big factor in the next fixture. The team needs a fresh look from somewhere else. I don’t think he will start because I believe Bento sees him as someone who can come in mid game and stir things up. But he will be the first sub off the bench, esp if chungy or son struggles again. If korea is down or tied, he will get his chance again against Qatar sooner than we expect. He was a way better addition to the team than Ji dong won was today…that’s for sure. What are people’s thoughts on the lack of quality in the final third? I’ve actually been happy with how we’re able to move the ball and dominate the 1v1s but have been shocked at the missed sitters or shots that go just wide or hit the goalpost. It’s quite infuriating how many goals we “should” have been up by in each of the Asian Cup games and I’m not sure where to find fault, e.g., tactics, training, individual sharpness/fatigue, etc. Yeah, we missed open shots. Son looked tired. Kim Minjae messed up on the goal. Lee Seung Woo looked like a chicken with his head cut off. But… hey, we won!!! In the end, that is literally all that matters. We’re in the quarterfinals. And oh yeah, I’ve seen this team play much worse in the past. I’ve seen us lobbing balls at Kim Shinwook’s head and Jung Sungryeong’s brain farting right in front of us. Also, I’m gonna reserve my judgement for when we play tougher opponents. Starting with Qatar (the only remaining team at the tournament with a flawless record on paper), then either the home country/Aussie, then the final, each step gets harder. Still hoping these guys play up to their opponents instead of what may have been playing down to opponents. Another great recap. I basically share al of the same sentiments. It looked like the Koreans are sleep walking through this tournament. Even watching it as a supporter was a snooze fest. Is it the lack of fear of conscription? LSW is the only one showing some emotion like he wants to be there and play. Maybe this will be a wake up call. @Roy- Not to skip ahead to the Qatar preview, but what is your opinion about Korea playing a more traditional 4-3-3 instead of the 4-2-3-1 like Bento did earlier as manager? Bring Son out wide. My memory is hazy but it feels like Korea was at least playing a little more imaginative using that formation. Also, if you guys can start doing more player ratings after matches, that’ll be great. The comments from some of the “homers” will be entertaining to read. I hope Korean defenders won’t make mistakes like the Chinese defender did before the 1-0. Yeah, they looked good. I think they’re playing the best in the tournament right now. Yes, also given that the video review showed that the Bahrain goal was offside. They should stay focused and avoid mistakes. Good that Jang Hyun-Soo isn’t in the team.